Black beans are one of my favorite types of legume. They are a good source of protein, soluble fiber, iron, folate, potassium, and other heart healthy nutrients. They are also high in magnesium. Cooking them from scratch is so simple, and is also cheaper than buying canned beans. I am planning to start cooking big batches of different beans, and freezing them so that I have the convenience of cooked beans without buying canned. This soup gets its wonderful smokey flavor from bacon (everything is better with bacon, right? 🙂 ) and a little chipotle chile powder. The chile powder gives the soup just the right amount of kick. 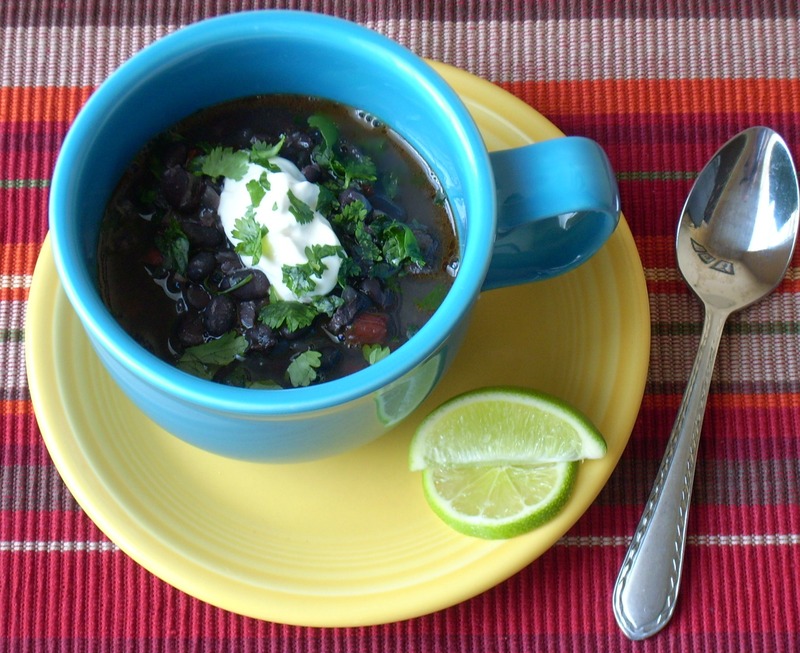 A little tip I got from the America’s Test Kitchen cookbook: If you hate the way black beans fade to an ugly reddish gray color, you can add a pinch of baking soda to the pot (about 1/8 tsp). This was the first time I tested this out, and as you can see, it actually does work! In a large pot, cook the bacon over medium heat until crisp, about 8 minutes. Stir in the bell peppers, onions, cumin, coriander, chipotle chile powder, and 1/4 tsp salt. Continue cooking until the vegetables have softened about 5 to7 minutes. Add the garlic and oregano and cook for 30 seconds more. Stir in the water, and scrape up the brown bits on the bottom of the pot. Stir in the beans, bring to a boil, skim off any foam, reduce heat to a simmer, and cook, partially covered, stirring occasionally, until the beans are completely tender, about 1 to 1 1/2 hours. As the soup cooks, add water if it begins to look a little too thick. Stir in the fresh cilantro and fresh lime juice. Check the seasonings, add salt to taste, and serve. Tip: Adding a pinch of baking soda to the pot at the same time as the beans will prevent the beans from fading. 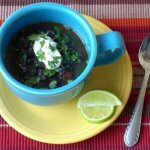 I love black beans and have never tried them in soup form. This looks great!